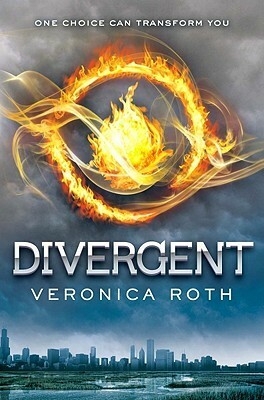 In Beatrice Prior's dystopian Chicago, society is divided into five factions, each dedicated to the cultivation of a particular virtue- Candor (the honest), Abnegation (the selfless), Dauntless (the brave), Amity (the peaceful) and Erudite (the intelligent). On an appointed day of every year, all sixteen-year-olds must select the faction to which they will devote the rest of their lives. For Beatrice, the decision is between staying with her family and being who she really is- she can't have both. So she makes a choice that surprises everyone, including herself. During the highly competitive initiation that follows, Beatrice renames herself Tris and struggles to determine who her friends really are- and where, exactly, a romance with a sometimes fascinating, sometimes infuriating boy fits into the life she's chosen. But Tris also has a secret, one she's kept hidden from everyone because she's been warned it can mean death. And as she discovers a growing conflict that threatens to unravel her seemingly perfect society, she also learns that her secret might help save those she loves...or it might destroy her. I really loved this book. I'm just going to say that right off the bat. It had hooked me right at the first sentence. (Way to go, Veronica Roth!) Well, actually I think I might have been pretty much sold right as soon as I saw the cover of the book. I know, I know, never judge a book by it's cover, but this one just really drew me in. I remember seeing the cover on a page in a magazine, and it literally JUMPED out at me. Like that was all I saw. It sounds weird, but it's true. I saw it, and in my head said: "I have to read that book! I have to go to Chapters right now, and buy that book!" So if I recall correctly, that is exactly what I did. And my spontaneity was most definitely not in vain! This book really delivered in terms of excellent characters, an intriguing plot, and a very interesting setting. First off, you better know that I am drawn to books with a strong, dominant female character. (Harry Potter, The Hunger Games, you get the picture) Independence, strong will and drive are three traits that main character Tris Prior possesses, which I find very admirable. It is always a sign of good characterization when you, as the reader, look up to the main character in awe, and wish you could have qualities such as the ones they have. I also loved Four as a character. He was the mysterious, thoughtful, older guy that I would probably fall for too. (He actually reminds me of someone I know in real life... so that added a bit of depth for me.) At first, when you originally meet Four, he seems reserved, and a bit cold and unlikable, but as you continue through the course of the story, he opens up slowly, and you get to see him in a new light. Other minor characters in the background of the overall plot, such as Christina, Al, Peter, Uriah, Will and Tori also added interest. A lot of the time, minor characters in books are kind of flat and boring, just there to be friends with the main character, or give them some bit of advice that will help them later on. But I felt that these characters each had a whole story behind them. You could see a little bit into their backgrounds, and even imagine a book being written about their lives. I really noticed development of all the characters. Not just the major ones. One last point I would like to bring up, is the fabulous setting and description. Veronica Roth really has a way with words, that pulls you into her world entirely. You can experience the dystopian Chicago that Tris is experiencing, right along with her. It was kind of magical to read. The Bad: there was violence described, so if that's not your cup of tea, maybe steer clear of this book.